Today we did our annual Emergency First Response training with our staff. We do this every year with all of our staff to adhere to our Dive Safe protocol. This is probably the most important training exercise we do, as we keep our first aid and emergency response skills sharp. I cannot tell you how important this is to us. Maybe this is why we have a perfect safety record? Check out these pictures of us training! 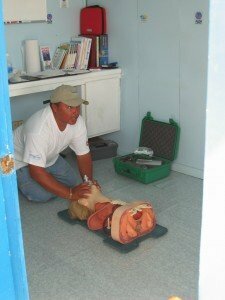 We also offer Emergency First Response as a course. Click here for a full description of our EFR Course.